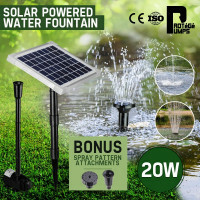 Packed with many practical and efficient features, Protege Solar Water Fountain Pumps are easily the favourites amongst professional pond installers and hobbyists alike. Create a water display in your garden and dazzle guests with zero running costs. Enjoy safe, automated and hassle-free operation without the need for electricity or wiring. 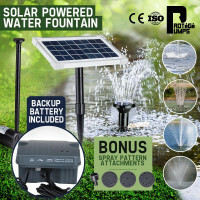 Protege Solar Water Fountain Pumps are great for both indoor and outdoor use. Equipped with electronic smarts, they can still function well even in cloudy conditions. The suction feet are there to secure the fountains in place. With quality and product performance guaranteed, these fountains are very easy to clean and maintain. Above all, they are solar-powered, making them the perfect ecological alternative. 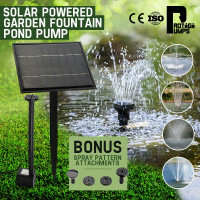 There are so much to love about Protege Solar Water Fountain Pumps. Each set comes with a premium polycrystalline solar panel, making it energy efficient as it operates using solar energy. With its DC brushless motor technology, having longer service life is already a given. Compared with conventional water pumps, these pumps allow you to save hundreds of dollars as they are extremely energy-efficient. 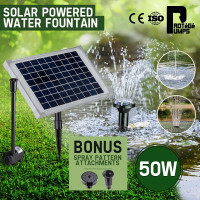 Protege Solar Water Fountain Pumps are available in 5W, 20W, 25W and 50W versions to suit your specific needs. Each kit comes with a full stainless-steel mounting shaft and an easy setup mechanism for hassle-free installation. The full-length 5-metre cable makes for easier positioning and relocation. The spray pattern attachments are designed to produce varying water effects. Some models also include a rechargeable battery backup to ensure continuous, quality and long-lasting operation. Mytopia is also home to other amazing and affordable garden tools and equipment. Choose from an assortment of Garden Lights, Garden Hoses, Compost Bins and Gate Openers. 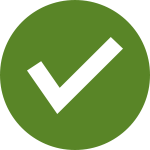 Protege Solar Water Fountain Pumps have passed some of the strictest quality measures today. Order one now and feel the difference and convenience of a trouble-free operation.